I volunteered to make playdough for my son’s Kindergarten class, and I was super surprised at the results of this recipe! 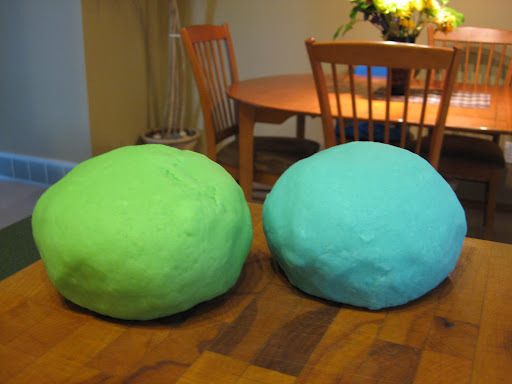 I have seen, but never made, homemade playdough before and I always thought it looked too sticky or too grainy. This recipe is neither of those things…it truly is perfect playdough! I did the microwave method and I only cooked it for 2 minutes. I stirred it every 30 seconds. I also used liquid food colouring, but next time I think I will try the Kool Aid. Mix dry ingredients together. Add the food coloring or Kool aid to the water and then add the oil. Mix dry and wet together and microwave on high for 1 minute or more, stir and microwave longer if necessary. Let cool, then seal in an airtight container. Teacher’s note: I microwave for three minutes all together. Remember, microwaves vary in strength. The playdough becomes somewhat translucent when ready. Cook over medium heat, stirring constantly until it forms a ball. Remove and knead a few times. Let cool, then seal in an airtight container. Will last approx. 1 month, depending on amount and time. This recipe is taken from the Winnipeg Free Press “Recipe Swap Favorites” by Iiana Simon. I have made this recipe many times and I find that you need parchment paper or else the biscuits will stick to an ungreased cookie sheet. I use 1/2 tsp of garlic powder, and I use just less then the 1/4 cup of melted butter. 1. Mix Bisquick, milk and cheese until soft dough forms; beat vigorously 30 seconds. Drop dough by spoonfuls onto ungreased cookie sheet. Bake in 450F oven for 8 to 10 minutes or until golden brown. 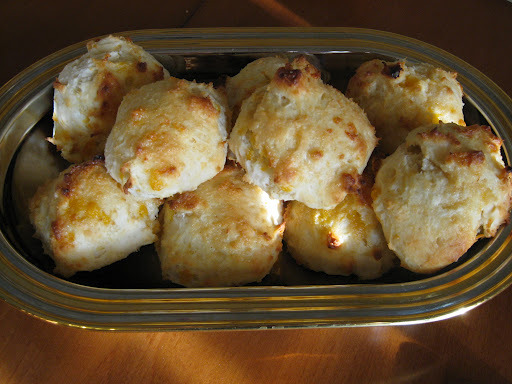 Mix margarine or butter and garlic powder; brush over warm biscuits before removing from cookie sheet. Serve warm.